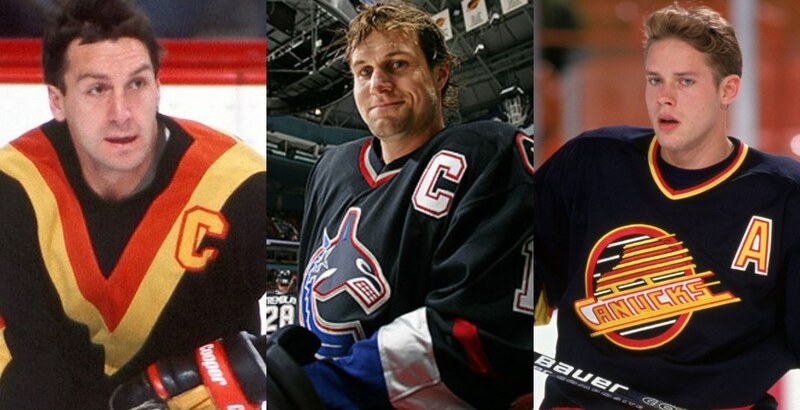 Few teams in professional sports have a more diverse jersey history than the Vancouver Canucks. From the Stick-in-Rink, to the Flying V, to the Flying Skate, to the Orca, the Canucks have experimented with multiple designs and nearly every colour in the rainbow. With the NHL allowing third jerseys for the first time since Adidas took over as the official supplier, fans have already begun debating what the Canucks should wear next season. We took it one step further, campaigning for the team to rotate through all of their old jerseys – good, bad, and ugly. While we still don’t know what alternate jersey they’ll wear next season, the Canucks have already begun working on the season after that. For their 50th anniversary season in 2019-20, the Canucks are inviting fans to vote for a throwback jersey that they’ll wear for select games. They’re giving fans three options: the Stan Smyl-era black Flying V, the Trevor Linden-era black Flying Skate, and the Markus Naslund-era navy blue Orca. Due to NHL rules, the Canucks need to make a decision this summer. The heavy favourite is undoubtedly the Flying Skate, although I could envision a groundswell of support for the hilariously ugly Flying V. The Orca has the most haters, but if it can appeal to memories of the West Coast Express (and not Mark Messier), it might be a long shot with a chance.